“This is the whole problem with words. There is so little surface area to reveal whom you might be underneath, how expansive and warm, how casual, how easygoing, how cool, and so it all comes out a little pathetic and awkward and choked.” If anything has ever described my inability to handle spoken communication, it’s those two sentences featured in Rebecca Lee’s award-winning short story, “Fialta.” I bounded with the words and characters featured throughout the collection. Rebecca Lee doesn’t create perfect people; she creates them perfectly flawed. She builds relationships like a contractor without a blueprint. The reader falls in love with their vulnerability, their incapability to speak words, and with the obsession with language. I’ve discovered another writer I’ll carry along with me. Of the seven stories, “Fialta” stands out the most. Aside from it winning the National Magazine Award for Fiction, it is the strongest story featured in the collection. As I read through the passages, the images spilled off the page—a portrait sketched and painted with fine-crafted words and language. It’s a collection I’ll revisit in the future several times. Rebecca Lee, one of our most gifted and original short story writers, guides readers into a range of landscapes, both foreign and domestic, crafting stories as rich as novels. A student plagiarizes a paper and holds fast to her alibi until she finds herself complicit in the resurrection of one professor’s shadowy past. A dinner party becomes the occasion for the dissolution of more than one marriage. A woman is hired to find a wife for the one true soulmate she’s ever found. In all, Rebecca Lee traverses the terrain of infidelity, obligation, sacrifice, jealousy, and yet finally, optimism. Showing people at their most vulnerable, Lee creates characters so wonderfully flawed, so driven by their desire, so compelled to make sense of their human condition, that it’s impossible not to feel for them when their fragile belief in romantic love, domestic bliss, or academic seclusion fails to provide them with the sort of force field they’d expected. 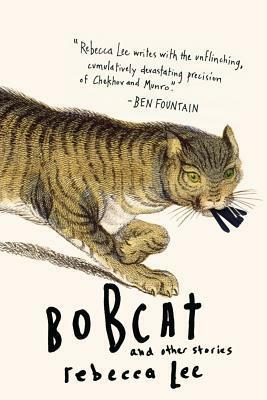 Bobcat and Other Stories is available on Amazon or Barnes & Noble. An e-book edition is available for Kindle and Nook.